I love this quote by Pema Chodron. (Psssst…I also include Pema’s beautiful words on an original poster below). “Life is glorious, but life is also wretched. Appreciating the gloriousness inspires us, encourages us, cheers us up, gives us a bigger perspective, energizes us. But if that’s all that’s happening, we get arrogant. We start to look down on others. There is a sense of making ourselves a big deal and being really serious about it. Wanting it to be like that forever. The gloriousness becomes tinged by craving and addiction. On the other hand, wretchedness–life’s painful aspect–softens us up considerably. When you are feeling a lot of grief, you can look right into somebody’s eyes because you feel you haven’t got anything to lose–you’re just there. The wretchedness humbles us and softens us. But if we were only wretched, we would all just go down the tubes. We’d be so depressed, discouraged, and hopeless that we wouldn’t have enough energy to eat an apple. 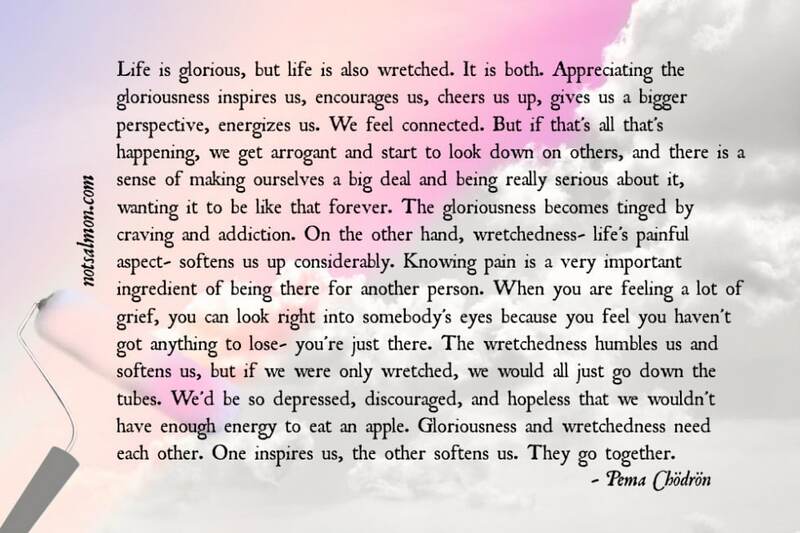 Gloriousness and wretchedness need each other. One inspires us, the other softens us. Want to make sure you remember these words? Print out the poster below! Or pass it forward to someone you feel my benefit from this reminder.